13.1" x 17.9" stitched on 14 count. 10.2" x 13.9" stitched on 18 count. Childhood Dreams - USA cross stitch pattern... 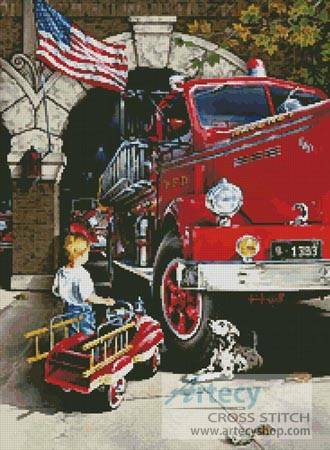 This counted cross stitch pattern of a little boy, wanting to be a Fireman when he grows up, was designed from the beautiful artwork of Dan Hatala. Only full cross stitches.